It all started when Leif Pearson wanted to drink on a bus. The Vegas native had moved out to Southern California to be a Microsoft trainer, but was back in town for a business trip on a charter bus -- where booze wouldn't be normally be out of place. 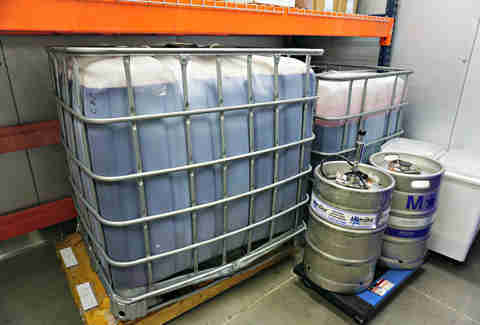 However, the charter company had just banned liquid alcohol on its buses, due to a messy spill the week before. 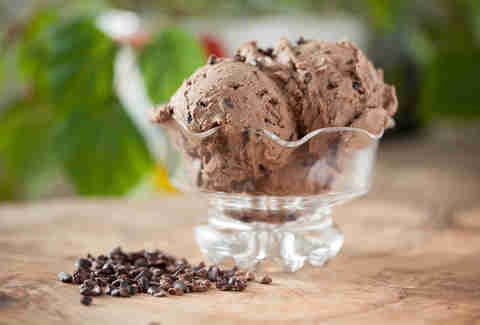 That got Pearson thinking about making alcohol-infused ice cream, and he started to experiment with a few recipes. "I made a White Russian ice cream the first time," he says. "It didn't quite freeze, but everybody really loved it on the bus." Pearson knew he was on to something. He moved back to Vegas and got together with his parents to form a boozy ice cream company. His father, a lawyer looking for a good business opportunity, helped finance the venture, and Momenti Spirited Ice Creams was born. Three years after Pearson hatched the idea, the company's line of products can be found in retail shops around Las Vegas, including Total Wine & More, Khoury's Fine Wine & Spirits, and Lee's Discount Liquor. Flavors include Chocotini Chip (similar in taste to a Godiva chocolate martini), Vodka Cookies & Cream, and White Russian Pecan -- which evolved from the first flavor made for that bus trip. 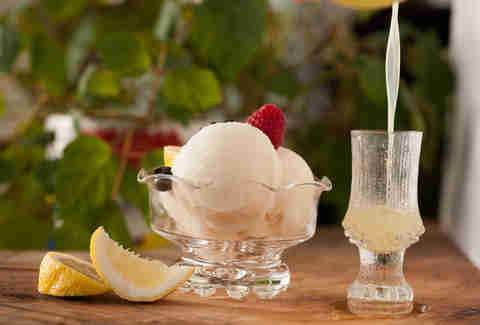 There are also two sorbets: Limoncello and Blackberry Cabernet. So on to the obvious question: "Will this give me a buzz?" The alcohol can be as high as 5.38 percent ABV (in the White Russian Pecan, if you're keeping track). That's in line with a typical beer. Eat enough, and you'll definitely feel it. Pearson believes in that using the best ingredients is imperative for yielding high-quality results. 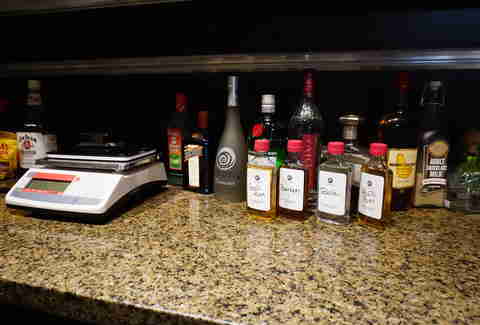 That includes using fresh lemon juice for the Limoncello, and high-quality chocolate for the Chocotini Chip. The wine is from Sonoma County, using grapes harvested in volcanic soil. "It's very tannin rich, but it has a fruit forward taste as well, so when we add fresh blackberry puree, it pops nicely," Pearson says. Every idea starts in a lab, or "development kitchen," that features a wide variety of ingredients, and Pearson will often invite local bartenders and chefs to help experiment. "They're welcome to come in and create flavors with me," he says. "It's a lot of fun." Most of the alcohol that's actually used in the final product is from Temperance Distilling in Michigan. Pearson says the alcohol is "every bit as good as -- or better than -- a lot of the brand names." It took Momenti about six months to find the right place to develop a factory. The team settled on an industrial space in the East Valley, where Las Vegas begins to merge with Henderson. 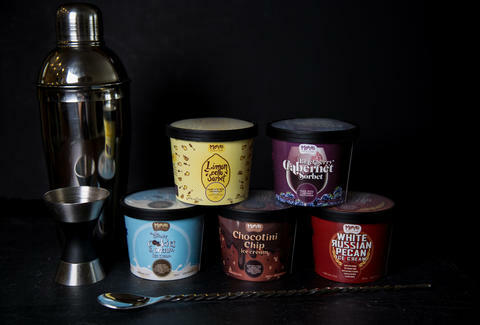 "It's probably the only factory in North America that specifically makes alcohol-infused ice cream," Pearson adds. "Everything is tightly structured; it's a 2,000 square foot space." Alcohol is an anti-freezing agent, so Pearson worked with a partner formerly of Häagen-Dazs and Dreyer's to develop a patented mix that can handle anywhere from 3% to 13% alcohol -- without getting less frosty. It's produced by Anderson Dairy in Las Vegas, and delivered to Momenti's semi-automated plant. No matter how big the production gets, the basic premise of ice cream hasn't changed much from the days when it was made in a barrel with ice and salt; something has to cool it. In this case, that something is a machine dubbed "Uma Burrman," which features spinning blades inside that cut off the ice crystals as the temperature gets colder. The product is pumped in from two giant mixers known as "Big Poppa" and "Vanilla Ice." The alcohol used is sometimes enhanced with orange wine, made from fruit sugars. As the ice cream thickens -- or as they say in the biz, develops "viscosity" -- it's transferred to another machine called "Cookie Monster," where "inclusions" are mixed in. Unlike diamonds, inclusions in ice cream are a very good thing -- think pecans and cookies. "That's the American diet," says Pearson. "To have nuts and chunks and fun stuff in your ice cream." Finally a machine named after American Idol winner "Fill Fill-Up" divides the ice cream into doses for packaging. And yes, every piece of equipment in the facility has a cute name. There's also "Sir Mix-A-Lot" and "James Earl Cones." 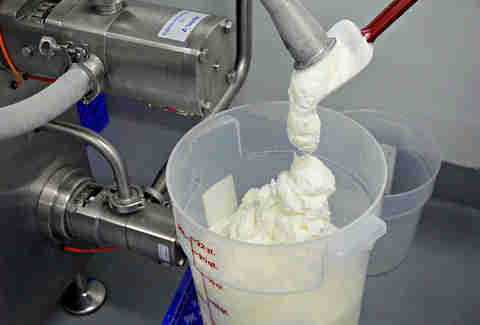 The machinery can produce about 1000 cups of ice cream in an hour -- or 185 gallons. The finished product is boxed and stored in a temperature of negative 20 degrees to harden at around the same consistency as frozen yogurt. "There are other competitors who do it, but not with the all-natural process we use," Pearson says. The final product is considered "super-premium," which means there's only about 30 percent air in the ice cream, similar to Häagen-Dazs' ratio. The plant generally operates three days a week with just a handful of employees, and Pearson spends the rest of his time actively promoting Momenti at different events around the country. He recently returned from a visit to Twitter headquarters. "We do a lot in Silicon Valley, because this concept is so new and novel," he says. Pearson is also looking to secure the funding needed to take the company national. He calls his brand of ice cream manufacturing "more art than science," but still utilizes the training from his previous life in the tech field. "I still get to work with computers," he says. "For instance, the batching is very calculator dependent." More boozy flavors are on the way. Momenti is working with local CraftHaus Brewery on a peach saison sorbet. There's also a Sparkling Strawberry in the works, made with either prosecco or white wine and fresh strawberries, that will be "perfect for weddings." Pearson has been experimenting with a bacon-bourbon flavor as well, and is open to making exclusive blends for individual restaurants. So for now, enjoy the ice cream as a locals-only treat. When Momenti takes the rest of the country by storm and is found in grocery stores from coast to coast, you'll remember that Las Vegas had it first. Rob Kachelriess has been writing for Thrillist for three years. He really likes the Vodka Cookies & Cream. Follow him on Twitter @rkachelriess.